W Vapes launched as a company in the summer of 2015 and their supercritical Co2 extracted cannabis oil vapes have been winning trophies and developing an extremely loyal fanbase of patients and customers ever since. The winning streak they’ve been on started when they were less than a month old and took home the Dab Cup in San Jose at Hempcon and they’re still going strong. 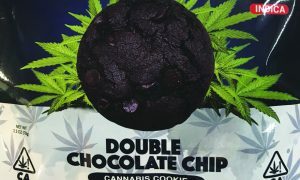 Less than 2 months ago they had multiple wins presented to them onstage by wrestling superstar Rob Van Dam at The Best of Edibles List Awards in Los Angeles. So why do they keep winning so many awards and what makes them so extra special? Well – let me tell you all about it. The story of W Vapes really begins in 2013 with a somewhat smaller vaporizer pen company called R.E.L.M: Refining-Extraction-Laboratory-Manufacturing, and the two incredibly special people who created it. Once upon a time; Jeff Nagel was a popular DJ performing and producing events throughout Europe and North America, and Amber Lee Abbott was an Elite Model, singer, songwriter and photographer travelling the globe. Serendipity brought them together in 2007, the same year the Pre-Interim Control Ordinance was enacted in LA, when a mutual friend recruited them both to California to run The Northridge Healing Center. Both were Southerners from the Carolinas, Jeff is from North Carolina and Amber from South, and upon arrival in LA they found themselves sharing a one bedroom apartment as they adjusted to the new landscape of Los Angeles. In less than a couple of months they realized they had fallen in love and they’ve been crazy about eachother ever since. After they became a couple, it wasn’t long before they had adopted a dachshund named Wheezie who is now nine and a half years old. After they left The Northridge Healing Center they went on to run the 105/405 Collective in North Hills and from there moved on to become the co-owners of Grateful Meds from 2009 to 2010 – a very popular dispensary that used to be at Melrose and La Brea where Wheezie worked with them everyday and where Jeff was the operating manager. After selling their shop they were able to invest in and focus on growing flower while they refined their skills and built their knowledge of everything you need to be a master of growing high quality cannabis on a diverse scale. It was only after they had mastered both the art and the science of growing that they decided to do that same thing when it came to making oil, and so that was where they began channeling their energies and attention and it was only then that they created R.E.L.M. and the seeds that would eventually bloom into what we now know as W Vapes had been planted. R.E.L.M. quickly developed a reputation in the industry that was good enough to attract the people who were managing Tommy Chong. Tommy, Jeff and Amber met over a dinner of raw vegetarian food and all three felt that they had enough of a similar vision in their hearts that they could definitely collaborate on a project together. Chong had a nice grow on his rooftop where he was cultivating Kyle Kushman’s Strawberry Cough strain. The flowers were processed into Tommy’s Oil and in 2014 the “Tommy Pen” was created and weighed in at 53% THC (Tetrahydrocannabinol) and 15% CBD (Cannabidiol) making it about a 3.5 to 1 ratio and very good medicine. Jeff and Amber continued to impress other high profile patients like Snoop Dogg and Mike Tyson, until they managed to attract the attentions of some very wise investors. Once they had finished deciding exactly what the new plan would be they were ready to launch a whole new company implementing the lessons they learned from having R.E.L.M. and choosing what and how they wanted to evolve when it came to their new business. The new company was, and still is W Vapes. It’s not exactly a simple task to get a definitive answer on just what the “W” stands for in the name W Vapes, and believe me when I tell you that, I worked there for a whole year. We’ve heard that it stood for weed, and it eventually came to mean Whatever-Whenever-Wherever which played toward the strength of the subtlety and portability of the product, but still isn’t exactly what you’d call a final thought on the matter. Like other legends of iconic status perhaps it’s better to leave the true answer shrouded in a bit of mystery. What’s important is that they didn’t waste any time moving full steam ahead making the new brand everything they’d ever imagined a cannabis oil vape pen could possibly be. Making great oil starts with sourcing or growing great flower and Amber and Jeff had become masters of both crafts. Once they had plenty of top shelf, pesticide free, organic plants to work with, they were able to set about refining and perfecting their extraction process. Using all-natural Supercritical Co2 was essential to extract the oil from the flower, and it also allowed them to first isolate and separate the valuable yet volatile terpenes before losing them to the temperature and pressure of the process. After removing and protecting the terpenes Jeff was able to re-introduce them into his oil during post processing and preserve the taste, smell and flavor of the specific strains he was using to make the W Vapes oil. Terpene separation and preservation was important to W Vapes, because it naturally allowed them to produce vape oil that tastes and smells strain specific, and also aids in giving the patients the full spectrum experience of medicating with their favorite strains of cannabis, as well as the full effects, however subtle, of what each individual is expecting from specific Indica, Sativa and Hybrid strains. Selecting the safest, and most effectively proper hardware was also very important to Nagel, Abbott and company . Medical grade stainless steel and glass cartridges were chosen utilizing a central pole inside rather than a cotton wick. This was uncommon in the beginning of 2015 and some of the cartridges you were seeing on the market were probably still using relatively porous plastic and a fair amount of propylene glycol in an attempt to produce large plumes and clouds when being vaped. It was important to W Vapes to be among the first to do a lot of scientific research in order to develop the highest quality product possible from “farm-to-table”. They hired their own PhD Chemist to help in the lab and continually ensure the quality of the product by doing as much in-house testing as possible, in addition to multiple third party outside testing laboratories. They test for purity, quality and cannabinoid content and always publish the full results on their website. They never mix strains or add any sort of store-bought terpenes, flavorings or additives. The stuff that really makes a business like this be not only successful but also special, is the people who work there providing the heart and soul of the daily operations. Juli Crockett, a retired but undefeated professional boxer, avant garde’ playwright, Americana musician and PhD joined the team as the Chief of Compliance and Strategy Specialist and it wasn’t very long before she was also Co-Chair of the National Cannabis Industry Association (NCIA) and on the Board of Directors of the California Cannabis Industry Association (CCIA). It was actually my own personal pleasure from 2015 to 2016 to work with W Vapes when they were still in the fairly early stages of their revolutionary evolution. The staff is made up of a variety of passionate and creative renaissance people who truly believe in what they’re doing and the compassionate mission they’re on. Only satisfied knowing that they’ll never stop growing and getting better, they continue to upgrade and perfect everything they do to create a lasting experience for loyal patients. The oil being made these days is processed until it’s platinum gold, pure and clear. 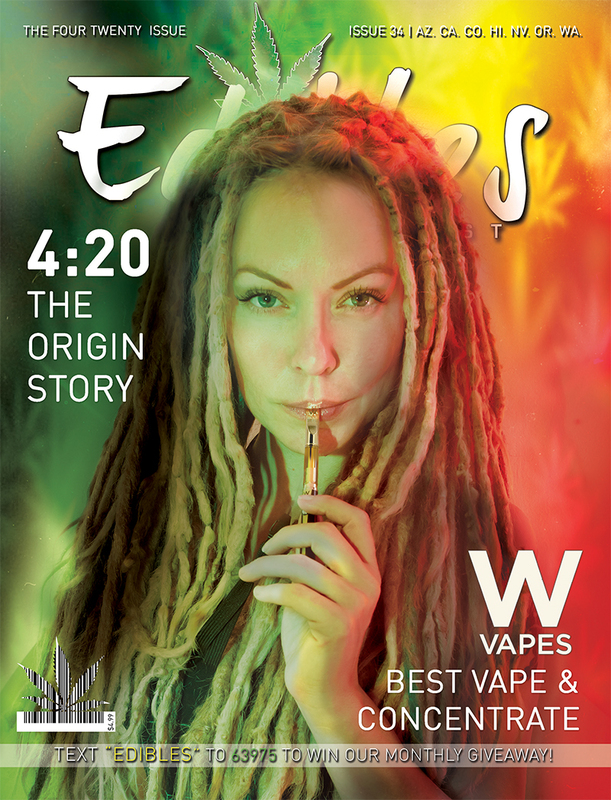 They also now do W Dabs – which are full grams of award winning pure Co2 concentrate perfect for dabbing, full flower strain specific CBD cartridges and 420mg All-In-One disposable vape pens that feature a double viewing window of the oil chamber. There is also a new Golden Gram Special Pen, as featured on the cover being enjoyed by Amber Lee Abbott and a line of specially infused pre-rolled joints on the way. The W Vapes website has a store locator and it’s updated daily so you always know where to find them, a list of all available strains with lab results and you can also read exactly what awards they’ve won. Some strains have over 80% THC and the full cannabinoid content is always printed on the packaging so you genuinely know what the strength of your medicine is going to be and how to dose effectively. It will certainly be exciting to see what happens next for these creative, passionate, and compassionate people. “W Vapes is the freedom to feel better, whenever and wherever you want.” The world sure appreciates that. To learn even more, visit their website at wvapes.com.